Lao PDR (Laos) is in some ways the forgotten country of South East Asia. Landlocked, it lacks the beaches which draw backpackers to Thailand, Cambodia, and Vietnam, and it’s largely missed out on the rapid development experienced by its neighbors. However being overlooked also means it has preserved its natural beauty and laid back way of life. This beguiling, wild country, as big in area as the United Kingdom but with less than one tenth of the population, is one of the most fascinating places I’ve visited in Asia. We flew into Vientiane, via Kunming. Most visitors then head north to the old royal city of Luang Prabang, but with only six days to explore, and a planned visit to Phonsavan’s mysterious Plain of Jars, we decided to base ourselves in the capital for most of our stay. Vientiane is a small city of around 600,000 people. It’s a charming place, but in truth there’s not a great deal to do there. However it is cheap: we stayed in a spacious accommodation in the comfortable S Park Design Hotel for less than RMB 250 per double room per night, and the boys loved swimming in the pool. There are also numerous restaurants and cafes, with the city’s French colonial history giving local cuisine an enticing mix of Asian and European influences. At La Vendôme the four of us enjoyed a three course meal with wine which you would not be disappointed to be served in Paris, and the bill came in at under RMB 500. 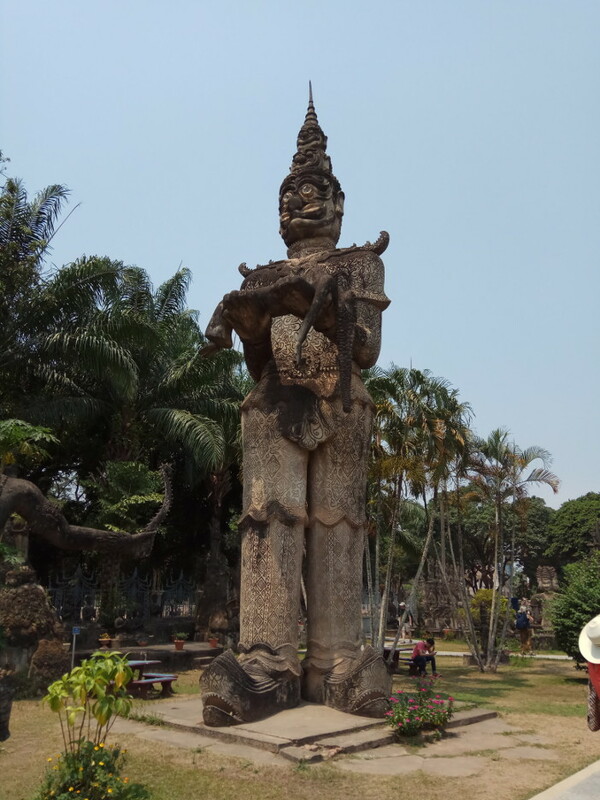 One sight no visitor to Vientiane should miss is the Buddha Park. 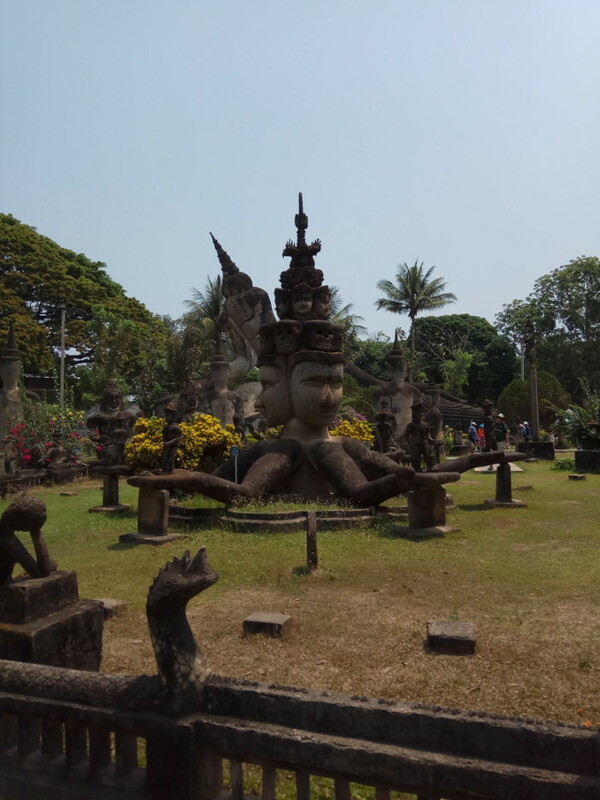 This was established in 1958 by a religious visionary, who inspired the local people to create concrete sculptures featuring a mixture of Buddhist, Hindu, and, erm… “other” figures. He later fled the country and set up a similar park across the Mekong in Thailand. The sculptures are at the same time crude and extraordinarily ambitious. Oddest of all is a giant pumpkin, inside which you pass through the human world to go down to hell and up through the spirit world, before emerging into the sunlight. 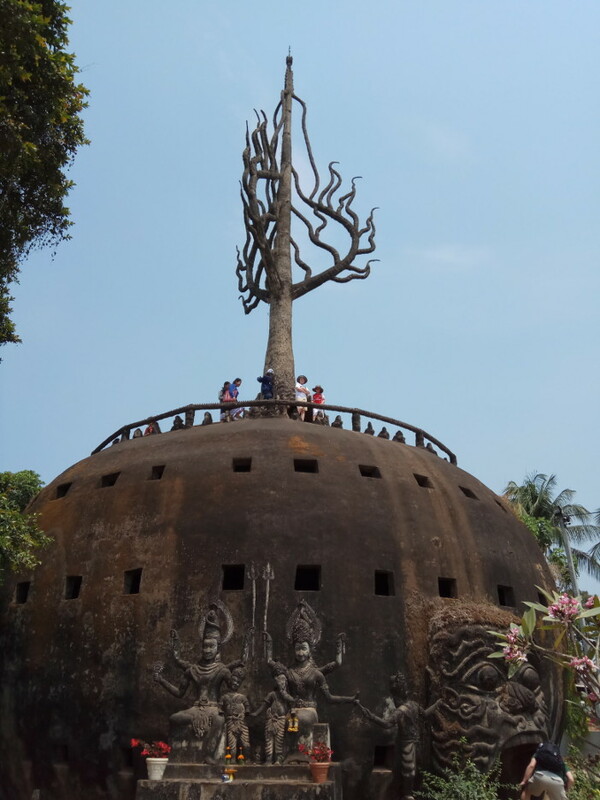 For my wife and I, the Buddha Park was an mindbending exhibition of outsider art. For my kids it was the site of an epic game of hide and seek, which they were still talking about days later. While I would not want to deter anybody from visiting Laos, there was one terrifying moment, which I share as a reminder to take care in developing countries. As we arrived at the beginning of the hot season, in the afternoons it was too exhausting to do anything other than swim. So I persuaded my family to accompany me on an early evening walk to tick off some of the “must see” sites. I’d been warned about the packs of feral dogs wandering around Vientiane, but it was only around 8pm, and we were walking down a brightly lit main road when it happened. Afterwards we tried to piece together the events of those few seconds, and as far as we can tell we must have startled a man sitting on a wall, because before we’d even noticed them his dog was up on its hind legs, forepaws against our 9-year-old’s chest, snapping and snarling. I’d been walking ahead, so I turned round and ran at the dog shouting to get it away from my son. This seems to have triggered a feral dog into attacking me, and I backed into the road, narrowly avoiding being run over. At this the man came, picked up his dog, and threw it over a low wall to get it away. He then gestured to us to carry on up the road, even though the wild dog was still growling at us from a distance. We turned around and headed rapidly back the way we’d come, hailing the first tuktuk we saw to take us back to the hotel. Fortunately, neither dog actually bit us; having to go for a rabies jab, while potentially lifesaving, would not have made for an amusing holiday anecdote. If you do visit Vientiane, I would recommend taking some form of dog repellent and staying in busy areas after sunset. In my next post, I’ll be writing about some more appealing animal encounters.